The foundations of this noble town palace date to the 15th century, with the majority of the construction carried out in the 16th century. The palace was home for nearly 500 years to the aristocratic Lasso de la Vega family, who became one of the more illustrious dynasties in Andalucia with notable Spanish literary and political figures. 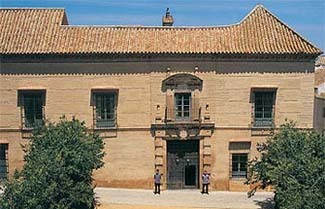 As common with many family dynasties, fortunes decline, and the palace in Carmona was allowed to fall into disrepair. In 1986, an aristocrat from Sevilla, Doña Marta Medina, bought the property and meticulously restored it to its former glory as a luxury hotel. Now her son, Felipe Guardiola, owns and manages the property. He and his wife, Reyes, live on the property with their three children. Although the hotel is rated as a luxury hotel, I would say the hotel is more in the style of a Spanish grandee. Don’t expect the carefully designed ambiance and facilities of a Ritz-Carlton. This is an old house filled with character and charm. Ask for a room on the first floor. Those on the ground level with the reception and public rooms can pick up the noise. The best room is one of the junior suites with a romantic double bed and beamed ceiling. Carmona is 25 km east of Sevilla. Follow the signs to the “Centro Histórico.” The hotel is signposted. Frequent buses also run between Sevilla and Carmona. Nearby: Explore the Roman, Moorish, and Renaissance architecture of Carmona. Grand homes in Andalucia never show their personalities to the outside world. The color and design remain within, and such is true at the Casa de Carmona. This is a Renaissance palace with Moorish touches. The sound of running water from fountains in a series of arched terra cotta and ochre colored courtyards fill the air. During the summer a canvas awning, called a vela, is pulled across the courtyard to keep it cool. Everywhere you look you see pots of plants and flowers, palms and citrus trees. Take time to relax in one of the wicker chairs and enjoy a cool glass of sherry, or fino as it’s called in Spain. Leading off the courtyards are several antique-furnished salons: the library, a writing room, and a billiard room. If walls are not lined with books, gilt-framed portraits take their place. Ceilings are beamed and painted, and polished wood floors suitably creak. A staircase imbedded with azulejos leads to the best guest rooms, which are as distinctive as the public rooms. Décor can be a shock of floral fabrics or soft pastels, with dark antique furnishings and an assortment of ornate mirrors and brass lamps. A dining room, furnished in a 19th-century English style and housed in the palace’s former stable, serves international and Andalucian cuisine. For something lighter, you can try Felipe’s bar for tapas and cocktails. The town of Carmona is a Spanish National Monument.